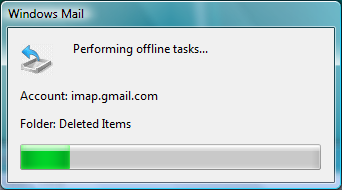 One of the best tricks to speed up Gmail IMAP access is to use offline mode in your email application. Offline mode is supported by popular email clients such as Microsoft Outlook 2007, Outlook Express (Windows XP), Windows Mail (Windows Vista), and Thunderbird. While you are in offline mode, your actions are carried out locally and the sequence is remembered by the email client. Later on, when you get back online, the same actions are then executed on the server. Offline mode is much faster (think instantaneous vs. several seconds for each action) than online mode because the email client does not have to connect/talk to the IMAP server each time you do something. Not all offline modes are created equally however. One would think that Microsoft top-of-the-line email client Outlook (2007) would have better support for working offline than its little brothers Outlook Express and Windows Mail, but that’s just not the case. According to my own testing, Outlook 2007 is the worst among the three when it comes to supporting offline access. 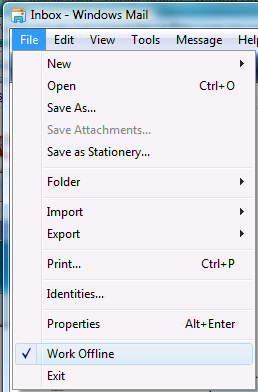 Specifically, you cannot copy or move messages in Outlook 2007 when working offline. If you have read my article Gmail IMAP Tips article, you know Gmail IMAP is all about moving and copying messages. Lacking the ability to move/copy messages in offline mode reduces the usefulness of Outlook as a Gmail IMAP client by about oh… 90% right there for me! I have not tested Thunderbird but it think I does support moving/copying images while working offline. I still use Outlook for its calendar and to synchronize with my i730 Windows Mobile phone, but for Gmail IMAP, Windows Mail (Windows Vista) is now my email client of choice. If anyone reading this is from the Microsoft Outlook team, please fix Outlook!